Below are the official screenshots from RISCOS Ltd. showing off RISC OS Select 3's visual highlights. RISCOS Ltd. saved their best features till last, you'll notice cut'n'paste between writeable icons, filer thumbnailing, new Paint and more. To view the full screenshot, click on the relevant thumbnail. Take the traditional Draw demo document and layer a PNG over the top with an alpha channel. The alpha channel enables multiple levels of transparency. Redesigned Filer choices to control new Filer features including thumbnailing. ImgViewer is a new utility that displays the big range of graphic files supported by ImageFileRender. Boring square icons. How grey. OK, we like the roundness. The new Window Manager allows modules to alter the appearance of icons on the desktop. The supplied IconBorder module allows you to make icons curved and tinted. Back to square but with a nice blue graduated tint applied. More fun with graduated icons - chose any colours you want, we can see themes designers incorporating iconborder settings in with their new toolsprites and iconssprites. RISC OS 4.36. Kernel 6.45. Select 3. Updated and redesigned Paint has improved toolbars and new menu structure among other updates. The colour picker shows the RGB and GCOL colour number of the selected colour for web designers and programmers, respectively. The toolbars now float alongside the Paint window like the Draw toolbar. Filer window of the supplied bin application called Recyclone. The bin icon appears on the iconbar and moves deleted files to its waste basket directory for later expiry. Useful if you accidentally delete a file, it can be easily fished out of the bin and restored. The DNS resolver configuration plugin can detect and list DNS servers (used for looking up internet domain and host names) present on a local network. Ok, here's a biggie. Using the mouse, writeable icons now allow the user to highlight text in them and cut'n'paste text between icons and the global clipboard. The highlight colour is configurable. Another top feature saved until last. 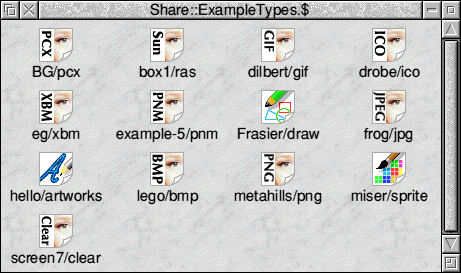 Take one directory of graphics files.. ..and select Thumbnail view from the filer to see scaled down versions of the graphics files, perfect if you're unsure what a file contains from just its filename.